← It’s Great To Be Eight! Summer is in full swing here; temperatures hover between 85° and 90°, with humidity levels making it feel a good 10 degrees hotter. So have we been hanging out at the swimming pool, or in the sprinkler? Or finding nice, cool activities to do inside? No-we’ve been canning! Seeing just how hot we can get the kitchen with multiple pots of boiling water and macerated fruit. I do have some great helpers in this effort. Mashing fruit with the potato masher is quite a coveted job around here! And it will all be worth it come January when we are snowed in, cracking open a little bit of summer in a jar. 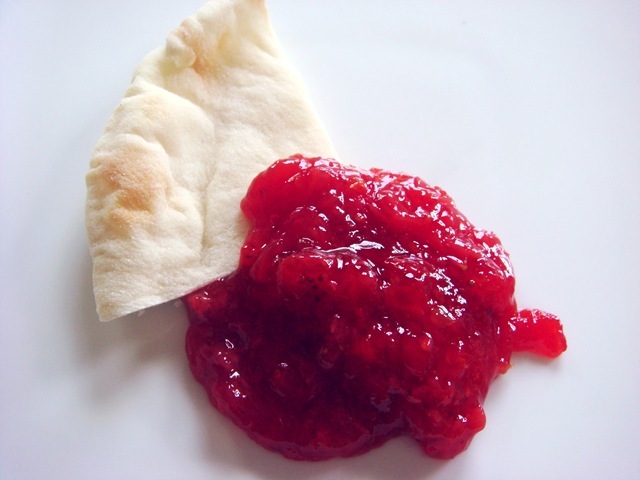 I tried several new jam recipes this week, including this Strawberry Citrus Jam. Made with strawberries and and a chopped orange (plus peel), it is quite tart. Not so tart that the kids wouldn’t eat it, however. They really like it. I do too. And I love how the orange really brought out the color of the strawberries. I make most of my jams low sugar (substituting all but one cup of sugar with stevia), and the lower sugar often makes the jam less bright and clear. But the added citrus really brightened up this jam! If you do try this jam, take a taste before you add it to your jars, and adjust the sweetness to your liking. Grate zest from orange into a large saucepan (you should have about 2 tsp). Cut white rind from orange; discard. Chop orange pulp and add to the saucepan. Stir in crushed strawberries, lemon juice, sugar and stevia. Optional step: Let fruit/sugar mixture sit for 1 hour to overnight (place in the refrigerator if you are going to let it sit overnight). Letting the fruit sit in the sugar will help sweeten the individual fruit bits. It also helps keep the fruit bits from settling in your finished jam. Stir pectin into fruit mixture. Bring to a hard boil (bubbles don’t stop when jam is stirred) over medium-high heat. Boil hard for 3-4 minutes, stirring constantly. Remove from heat. NOTE: This is a tart jam. Try the jam at this point. If it is not sweet enough, add additional stevia or sugar. 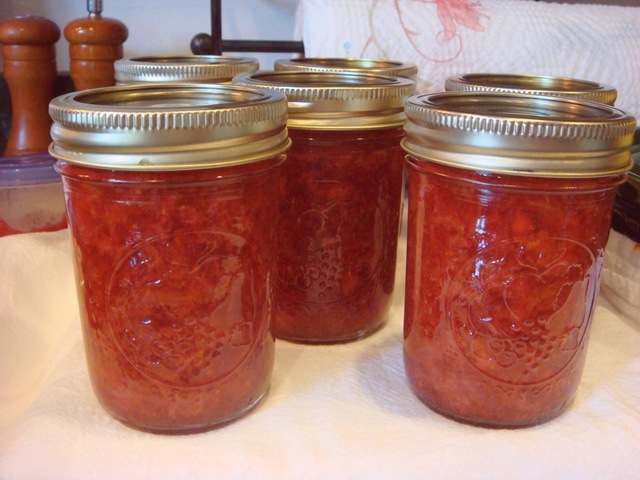 If you add additional sweetener, return jam to a hard boil before filling jars. Ladle jam into sterilized jars. Wipe rims; add lids and rings. Process in a boiling water bath for 10 minutes. Let jars sit on a towel on kitchen counter for 24 hours to set. Check seal.